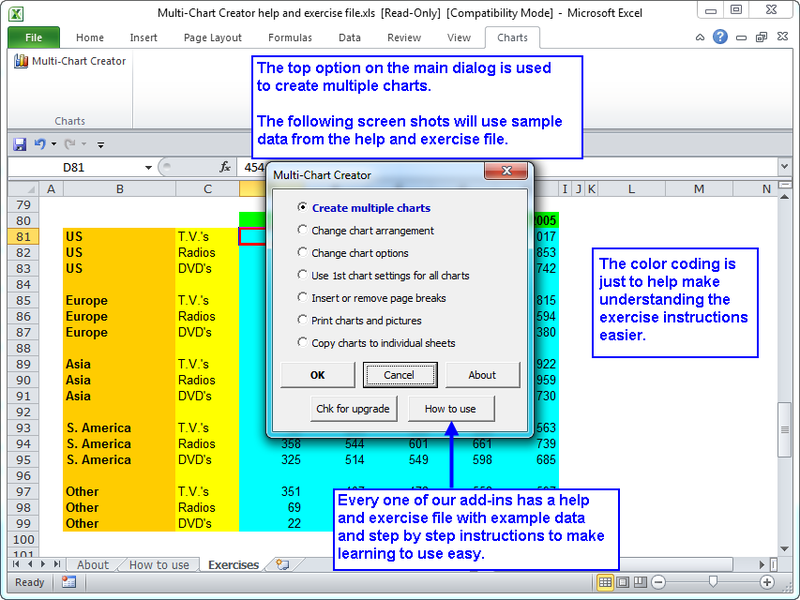 The Multi-Chart Creator add-in for Microsoft Excel allows you to easily create hundreds of charts. It is compatible with Microsoft Excel 2007 to 2019 and Office 365. The Multi-Chart Creator is completely menu driven and comes with a detailed help file to help you in its use. In addition to creating charts, the Multi-Chart Creator provides an option that allows you to re-arrange the charts on a worksheet. You can arrange the charts 2, 3, 4 or more across and specify how many charts are viewed per every "N" rows. Other features of the Multi-Chart Creator let you add page breaks every so many rows and to print the charts individually.